Beginning January 20th, our office hours changed and we are open for business from 8:30 till 3:30, Monday thru Thursday. Please remember we have a secure drop box at the main gate. We’ve also added a drop box outside the office door, in case the gate is open but the office is closed when you get here. FOG in the sewer system can cause backups in the pipes and cause problems at the Treatment Plant. 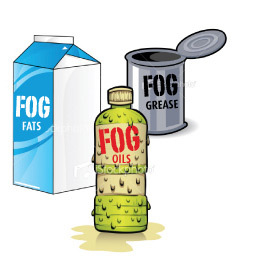 Here are some quick Dos & Don'ts to keep fats, oils and grease out of our sewer system.